happy hour at the G.
$8| Soup & Salad Combo: Choose from a small house or Caesar salad, with one of our signature soups. with Sicilian extra virgin olive oil, herbs, spices and balsamic vinegar. rustic bread crostini, herbed ricotta, tomato salsa cruda, mixed olive tapenade. in a rich cream sauce and broiled with Parmesan crust served with rustic bread. full pound of Pacific Manila Clams simmered with white wine, garlic, herbs and spices. house made with marinara, Parmesan and fresh herbs, served with rustic bread crostini. All soups and dressings are made from scratch. Salads are available in half and full size. Add chicken to any salad for $4.95 or prawns for $7.50. tangy Italian blue cheese blended with San Marzano tomatoes and cream. classic recipe, sausage, lentils, hearty root vegetables and spinach in a rich cream broth. variety of lettuce blended with carrots, tomatoes, cucumbers and house made croutons with your choice of dressing on the side. tossed with romaine, shredded Parmesan, house made croutons, and lemon. roasted chicken, salami, onion, tomato, cucumber, iceberg, romaine, basil, Parmesan and garbanzos tossed in red wine vinaigrette. roasted chicken, diced apple, dried cranberries, feta, avocado, candied pecans, and house made roasted shallot balsamic vinaigrette. iceberg lettuce, blue cheese dressing, apple wood smoked bacon, red onion, and roasted tomato. Our unique Neopolitan-style pizzas are made with our house made dough, San Marzano pizza sauce and baked with fresh ingredients in our wood fired oven. Naples original: San Marzano tomato sauce, fresh mozzarella, basil, sea salt and extra virgin olive oil. House made sausage, roasted onion, fresh herbs, fresh mozzarella and San Marzano tomato sauce. Zoe’s pepperoni, Mama Lil's peppers, roasted onion, roasted crimini mushrooms, Kalamata olives, fresh mozzarella, San Marzano tomato sauce. Smoke House BBQ sauce, free range chicken, cilantro, red onion and fresh mozzarella. Marinated artichoke, Kalamata olives, roasted crimini mushrooms, prosciutto, basil, extra virgin olive oil and fresh mozzarella. Spinach, feta, fresh mozzarella, roasted onion, and roast crimini mushrooms on an extra virgin olive oil base. Finished with reduced balsamic. Zoe’s pepperoni and fresh mozzarella over San Marzano tomato sauce. Topped with shaved Grana Padano cheese and fresh herbs. Extra virgin olive oil, fresh mozzarella, prosciutto, shaved Grana Padano cheese. Topped with fresh arugula tossed with olive oil and lemon. Roasted onion, fresh mozzarella, cherry tomato, apple wood smoked bacon and fresh herbs on an extra virgin olive oil base. Zoe’s pepperoni, house made sausage, prosciutto, roasted onion, fresh mozzarella, San Marzano tomato sauce. House made pesto, chicken, marinated artichoke, fresh mozzarella, roasted cherry tomatoes. Our sandwiches are made with our wood fired rustic bread and served with a side of pasta salad. prosciutto di Parma, fresh mozzarella, basil, Mana Lil's peppers. oven roasted chicken, house made pesto, fresh mozzarella, fresh tomato. thinly sliced sirloin steak, fresh mozzarella, caramelized onion, horseradish aioli. two beef and pork patties, Gorgonzola cheese, Mama Lil's peppers, arugula, balsamic reduction. slow simmered classic Garlini Family marinara with house-made meatballs, topped with fresh basil and Parmesan. free range chicken grilled in house-made garlic Parmesan cream sauce. fresh Manila clams tossed with a touch of cream, garlic, herbs and red pepper flake. Finished with extra virgin olive oil and lemon. in a rich four-cheese sauce with apple wood smoked bacon, fresh herbs and toasted breadcrumb crust. black olives, sun-dried tomato, and a pinch of red pepper flake sautéed with penne pasta in a pesto cream sauce (add chicken 5.50, prawns 8.50). spaghetti with garlic, red pepper flake, fresh herbs, extra virgin olive oil, cherry tomato and lemon (add chicken 5.50, prawns 8.50, wood fired veggies 4.95). jumbo tiger prawns and rock crab tossed in our garlic Parmesan cream sauce. hand rolled, filled with beef, pork, spinach, mushrooms, ricotta, topped with charred besciamella & basil. baked layers of fresh pasta, San Marzano sauce, beef, sausage, and four cheeses. fresh local Washington free range chicken in light cream sauce with apple wood smoked bacon, fresh tomato, spinach, feta and spicy chicken breast. our classic house recipe of carrots sautéed with garlic and herbs. house blend of broccoli, mixed bell peppers, mushrooms, onions. oven roasted with shallots and butter. *The Chelan County Health Department would like us to remind you that eating certain raw or undercooked foods may be hazardous to your health. A gratuity of 18% may be added for parties of 8 or more. 4 jumbo shrimp wrapped in apple wood smoked bacon, served over lemon arugula with house aioli. slow simmered classic Garlinis Family marinara with house-made meatballs, topped with fresh basil and Parmesan. spaghetti with garlic, red pepper flake, fresh herbs, extra virgin olive oil, cherry tomato and lemon (add chicken 5.50,prawns 8.50, wood fired veggies 4.95). Fresh Free Range Chicken in light cream sauce with apple wood smoked bacon, fresh tomato, spinach, feta and spicy chicken breast. spaghetti sautéed in garlic and olive oil, pancetta bacon, egg, cream and pepper. Finished with Parmesan cheese and green onion. 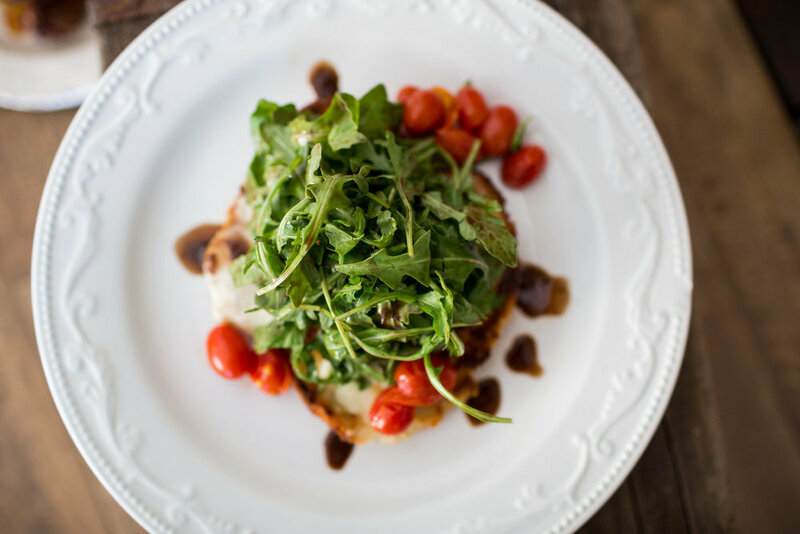 panko breaded, pan-seared fresh local Washington free-range chicken breast with aglio e olio pasta, fresh mozzarella, roasted tomatoes and balsamic tossed arugula. grilled public market sweet fennel Italian Sausage with peppers, onions, and San Marzano tomato sauce over spaghetti. grilled Wild Ahi Tuna steak, olives, artichoke, pepperoncini, roasted tomato sauce, lemon-caper aioli. Certified Angus Beef pan roasted with whipped Yukon Gold potatoes, seasonal veggies, Gorgonzola and red wine pan sauce (add prawns 8.50). dry rubbed, oven roasted salmon served with whipped Yukon Gold potatoes and seasonal veggies. pan-seared, served with roasted Red Pepper sauce and house made fresh Tagliatelle pasta. with roasted garlic, herbs and cracked black pepper. Slow simmered classic Garlini Family marinara with housemade meatballs, topped with fresh basil and parmesan. Slow simmered classic Garlini Family marinara topped with fresh basil and parmesan. Washington Free Range Chicken grilled in housemade garlic parmesan cream sauce. Black Olives, sundried tomato, and a pinch of red pepper flake, sauteed with penne pasta in pesto cream sauce. Spaghetti with garlic, red pepper flake, fresh herbs, extra virgin olive oil, cherry tomato and lemon. Baked layers of fresh pasta, San Marzano sauce, beef, sausage and four cheeses. Fresh Washington Free Range Chicken in light cream sauce with applewood smoked bacon, fresh tomato, spinach, feta and spicy chicken breast. Spaghetti sauteed in garlic sauce and olive oil, pancetta bacon, egg, cream and pepper. Finished with parmesan cheese and green onion. Mixed greens blended with carrots, tomatoes, cucumbers and housemade croutons, with your choice of dressing on the side. Tossed with romaine, shaved parmesan, housemade croutons and lemon. Roasted chicken, salami, onion, tomato, cucumber, baby romaine, basil, parmesan and garbanzos. Tossed in a red wine vinaigrette. Roasted chicken, diced apple, dried cranberries, feta, avocado, candied pecans and Cucina balsamic vinaigrette. Our classic house recipe of carrots sauteed with garlic and herbs. House blend of broccoli, mixed bell peppers, mushrooms and onion. scratch made food. crafted with love. Garlinis Napoletana has brought a slice of Italy to the Wenatchee Valley for many years. We pride ourselves on our traditional Italian dishes. From our house-made pasta sauces and salad dressings to our cozy atmosphere and hand-crafted cocktails. Our friendly staff is trained to go above and beyond all expectations, so come enjoy a night out with the family, an intimate date-night for dinner, or happy hour with friends!